Platform’s 76’s iD Generator lets you pretend to be someone else for a little while (on a badge). It’s something I imagine Barney Stinson in “How I Met Your Mother” might use. Flash the badge as an introduction to get an “in” with the ladies, but I suspect it would be more effective on the guys. This app lets you add a photo of yourself and generate different iDs. It allows you to be anything from a fireman to a prom queen. Simply select a photo in your photo gallery and set it as the picture for your new iD. Then browse through the selection of iDs and hit the button to “save the current pass” to your photo gallery. 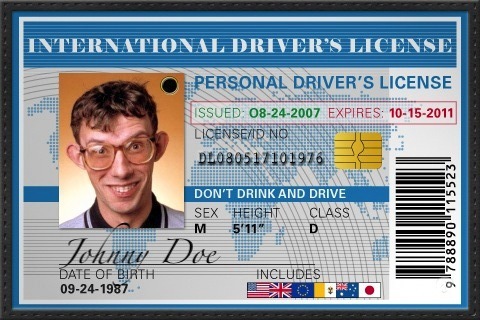 You’ll have more than 25 different iD cards to choose from with version 2.1 of iD Generator. Identities include mundane ones like doctor, fireman, and FBI to outrageous ones like Heineken Party Squad, Lesbian Vampire Killer, and Female Body Inspector. iD Generator is a nice basic app for generating fun iDs. The interface is intuitive and very easy to use–no tutorials are necessary. The graphics are also decent for an app of its kind. It’s not as detailed as the Badges app or the Field Agent Fingerprint App, but it offers more variety. Although I highly doubt any bartender would give you a drink if you were underage and flashed the Fake ID iD. And you certainly couldn’t get into FBI headquarters with the FBI iD. It might score you that cutie’s number at the laundromat if you wanted to go with a funny approach. The iD images do show up well in portrait and landscape view. And the limited controls required to generate an iD perform smoothly and are responsive to the touch. Developers need to add more iDs and greater detail to the graphics. As is, the app does not have enough replay value to warrant its price tag. The developer should add occupations like rocket scientist, computer engineer (hot! ), software developer, and professional chef. What gal or guy wouldn’t like to date a professional chef? The developer should also consider changing the save button from “save the current pass” to “save the current id” just for the sake of conformity because “pass” is not used elsewhere. Overall, this is a decent app, although I wouldn’t drop $0.99 on it personally. But if I was single and someone introduced himself or herself using a fake iD, he or she’d get a laugh and more minutes of my time than he or she would’ve gotten. It might also just be something silly you share with your pals, kids, and co-workers to earn a few laughs. AppSafari review of iD Generator was written by Linda Ta on March 30th, 2010 and categorized under App Store, Dating, Fun, Utilities. Page viewed 9810 times, 6 so far today. Need help on using these apps? Please read the Help Page.